81/100 #100sareepact is cotton Dhonekhali , taant, which has horizontal stripes over the entire body. 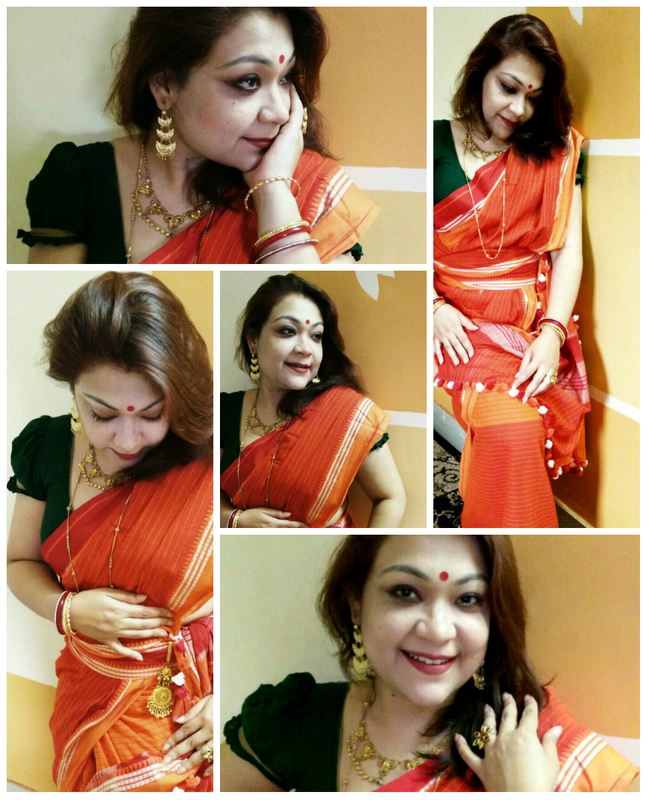 This bright shaded orange saree, has unique soft cotton like pieces, which hang as a part of the design in the anchal. 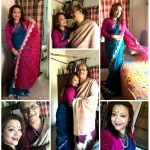 This special piece is a cotton saree made in Dhaniakhali, West Bengal. It is a saree with 100 by 100 cotton thread count, six metre long drape that has these distinctive designs of borders between 1.5 and 2 inches. The story highlights, the candid drape of mine. This is a typical Bong drape, which has the makeshift rural touch! The pairing blouse has a bulging design near the shoulders, again a typical Bong connect. With the golden jewellery, red bangles, and the key-chain in the waist, I intend to highlight the drape which is a unique pattern for rural Bengal or candid drape. It hardly took 1-2 minutes to wear this way and to my surprise my entire look was complete by 20-minutes. For an exception just note 81/100 does not have any hidden story, or crazy angle. Like the way it is draped, this story is simple and easy.